Festive family favourite Winter Wonderland returns to London’s Hyde Park with big top shows, the observation wheel and a huge Christmas market. Winter Wonderland provides fun, laughter and excitement for both adults and children. As well as the stunning ice rink, Winter Wonderland includes gentle rides for younger children. Children can meet Santa in his grotto every day from 10am to 6pm. Entry is free but the queue will close at 4pm on busy days. 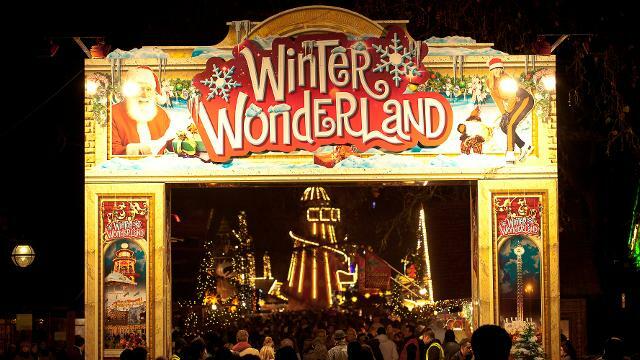 The gates will open to Winter Wonderland on Friday 22nd November at 5pm! This year promises even more thrills, spectacle and Christmas magic at Hyde Park, where we’ll be open 10am till 10pm every day until 5th January (excluding Christmas Day). As always Winter Wonderland is FREE to enter, so you can wander through the park, soaking up the festive atmosphere and enjoy all the free entertainment on offer. If you want to go Ice Skating, visit The Magical Ice Kingdom, take a ride in the Giant Observation Wheel or see a show at Zippos Circus you will need to buy tickets. These attractions sell very quickly so advance booking is highly recommended! At Winter Wonderland there’s something for everyone, whether you want to make your child’s dream come true at Santa Land, brave the exciting thrill rides, or just warm up on a mulled wine and join in the fun in the lively Bavarian Village. Come along early for a browse around the Christmas Markets, take a rest over some festive food and drink at one of the many eateries around the site, and enjoy some of the fantastic free live music. Posted on November 3, 2013, in christmas markets, Christmas Tours, Discount London, Uncategorized, Visit London and tagged London Christmas and New Year Tours, Winter Wonderland. Bookmark the permalink. Leave a comment.